Fletch experienced his first snowfall last Saturday. I think he is a little indifferent at this point, but I'm sure he'll enjoy it when he can actually play in it. 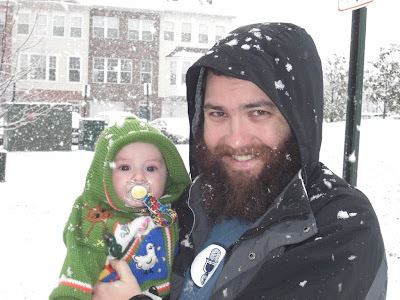 We attended Sammy's birthday party at the clubhouse, so while we walked over I snapped a shot of Fletch with Daddy in the snow: I put the sweater Uncle Chris gave on Fletch. It's pretty darn cute and he'll be growing into it this winter season. I even found some small mittens at BRU that fit Fletch. Unfortunately Fletch doesn't have any fur on his face to keep it warm like Daddy (but I'm okay with that).